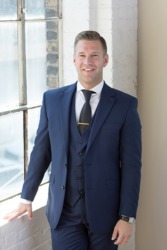 Jordan Bauer is a graduate of Mitchell Hamline College of Law with a wealth of knowledge in real estate law, but his true passion is and always has been real estate. He brings his passion and sharp attention to detail to help buyers in a highly focused search for their new house and to help sellers get the most value for their home. Drawing from years of experience in the legal profession, Jordan has built a reputation for his honed negotiation skills and friendly client care. Jordan’s comfort level spans serving everyone from high-profile corporate clients to individuals and families looking to find their perfect home. Jordan understands that buying and selling is one of the biggest decisions in a client’s life and views representation and guidance of his clients through this process as a true privilege. He is dedicated to listening intently and matching individuals and families with the properties, buildings and neighborhoods that best suit their needs. Treating customers like family is both a guiding principle and a way of life for Jordan. A 30+ year resident of the Twin Cities, Jordan’s commitment to his community is strong. A philanthropist, an athlete, a family man, a Realtor.